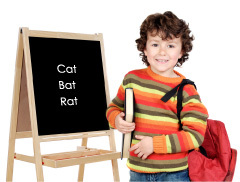 Students will learn to recognize sets of rhyming words in songs, speech, and poetry. Students will indicate rhyme recognition by responding with a physical movement. Recognizing rhyme is a basic component of phonemic awareness, a critical pre-reading skill that students must acquire in preschool years or kindergarten to prepare them for decoding and spelling words through phonics. To help students develop rhyme awareness, it is important to maximize their exposure to rhyme through experiences in listening to rhyme, singing and reciting rhyme, discovering and responding to rhyme, and creating rhyme through playful and age-appropriate activities. In addition, physical response to rhyme (e.g., clapping, tapping, bending...), reinforces learning about rhyme by including more of the total body in the learning experience. The song, Rhyme in Time, appeals to students’s funny bone through its whimsical and nonsensical lyrics and its wacky and unusual characters. This song gives students a chance to demonstrate rhyme recognition by tapping feet, tapping hands, or tapping objects every time they sing a rhyming word. It should be stressed that, at this stage, recognizing rhyme is an auditory skill, rather than a visual one. In other words, students recognize the sound of rhyme when they hear it but do not generally have the skill level to read or spell rhyming words. However, for students who already recognize some letters and sounds, song lyrics on the Mini-Charts can help them build their skills in spelling and reading rhyming words. This lesson is the first in a series of five lessons. The next lesson, Kindergarten Phonics Phonemic Awareness: Consonants, teaches students to recognize beginning sounds through tongue twisters. Optional: rhythm instruments for tapping such as tambourine, rhythm sticks, drums, or common objects for tapping such as pencils on books, fingernails on table, wooden spoon on pot lid, etc. Note: If you do not have the CD or Mini-Charts, you can still teach this rhyming words lesson plan using the folk tune listed on the Rhyme in Time Song Lyrics page. For this level, it is good practice to include pictures, for visual reinforcement. Order our cost-saving Ready to Read Combo online. Play Sing Your Way Through Phonics Ready-to-Read! CD Track 1, turning the pages on the Mini-Charts as the song is sung. Lead students in tapping at the appropriate times. Say.“Let’s see if you can help me with some of the words. When I hear words that rhyme, I always tap in ____. ” (time) Continue, “And if you agree, just tap along with ___.” (me) “So listen for the rhyming and be quick about your ____.” (timing). Supply any missing words that the students do not remember. Say, “Now, let’s play the song again and join in as much as you can. ”; Students should be able to sing verses 1 and 7, as well as all of the odd number Mini-Chart pages which repeat virtually the same text. Turning to Mini-Chart page 6, say, “Do you think you remember the rhymes about the goose? Tell me the missing words,” “I saw an old gray ___” (goose) “Who said her tooth was ___.” (loose) “Until a friendly ____.” “(moose) gave her watermelon ___.” (juice) If students have difficulty remembering the story, replay CD track 1, asking them to sing along whenever they can as they follow the pictures. Be sure to continue modeling taps on the rhyming words. Continue omitting the rhyming words for the students to supply with verse 5 on pages 10: “I saw a sleepy ___.” (skunk) “Who slept on piles of ___.” (junk) “He didn’t mind the ___.” (clunk) “When he got into his ___.” (bunk) If students are unfamiliar with the word bunk, be sure to go over the meaning with them. Say, “Now, let’s see if we can sing the whole song, but let’s think of something different to tap on the rhymes.” If students have tapped feet previously, they might tap knuckles on desks or tables or they might tap pencils on books. They’ll think of something! Remind them that they are only tapping on the rhyming words when they come. If necessary, practice a verse with the new taps at the right time before re-playing the CD. Replay CD track 1 and gradually drop out of leading the students in tapping the rhymes. How well did they do in identifying rhyming words? Were they able to withhold tapping until just the right time.? Which students need more practice? Students who tap only on the rhymes can be leaders for the group, and the others can follow them the next time the group sings with the CD. Practice singing Rhyme in Time every day for a week. Then try singing the song with the instrumental track on the CD (Track 2). Do the students remember all the words to the song? Review any that are giving them difficulty and use the pictures on the Min-Charts to aid memory. Help students create other sets of rhyming words for the song. Make 5 copies of Mini-Chart template p. 78 or 79. Get ideas for animal characters from the students—seal, dog, cat, whale, etc. Choose one (e.g., seal) and help the students generate as many rhyming words as they can (e.g., real, feel, deal, meal, peel, heel, steal, kneel). To assist students, supply the beginning sounds to help generate rhymes. For example, say “seal / f-f-f” for the rhyming word “feel.”; Once the rhyming words have been generated, fill in the first blank on the Mini-Chart template, asking for a descriptive word (e.g., “sleepy seal”). Help them fill in the second blank by thinking of something the character did or think of something about the character that includes another rhyming word (e.g., ...“who had a slimy feel”) Help students come up with two more sentences about the character that end with other words in the rhyming family. (e.g., “He slipped and hurt his heel, on an old banana peel.”) Allow students to illustrate the new lyrics in the box on the Mini-Chart template. Place pages with new words in a 3-ring binder in page protectors and sing with the instrumental track on the CD (Track 2). Practice discovering and creating rhyming words in Nursery Rhymes like Hickory Dickory Dock. Students indicate that they know where the rhyming words are by performing some motion on the rhyming words. Examples: bending, jumping, exercise movements. Omit the rhyming words and help the students supply their own substitute words. This works especially well with Nursery Rhymes that include nonsense words. Examples: Hickory Dickory ding; the mouse ran up the swing. Or Hickory Dickory deet; the mouse ran up the street. Read rhyming stories and poetry and ask students to indicate that they recognize the rhymes by performing physical movements or playing rhythm instruments on the rhyming words. Use one-syllable, two-syllable, and 3-syllable rhymes. Dr. Suess books are good for this purpose, as are the poems of Jack Prelutsky and Shel Silverstein. Students who know some of their letters and sounds can help spell or write rhymes that they create for the song and can help read rhymes in simple rhyming books like Dr. Seuss’ I Can Read It Myself books. Students indicate their recognition of rhyming words by making appropriate movements on the rhyming words, without assistance. Order our cost-saving Sing Your Way Through Phonics Ready to Read Combo online ($33.95) containing the CD, Mini-Charts, Song Lyrics, and Teaching Suggestions — everything you need for this lesson! Or, print out an order form to mail or FAX to us.